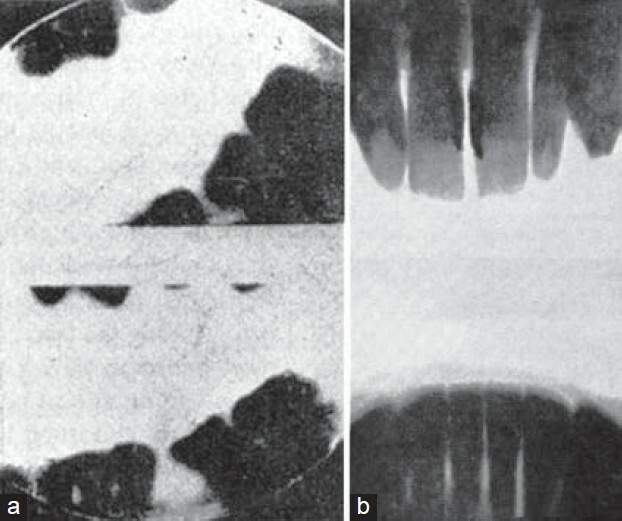 X-rays were applied in dentistry for the first time only a few months after their discovery in 1895. 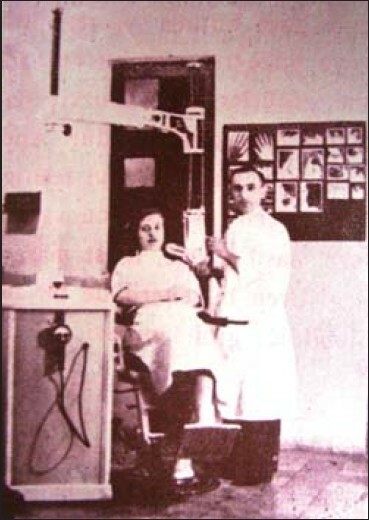 In this article, on the 118 th anniversary of the introduction of X-rays into medicine, we give an account of the history of dental radiology in Turkey. It will be informative to give information about the development of dental radiology education. The history of education is outlined in [Table 1]. Today, with about 40 dentistry faculties that have a radiology department, the state of radiology at both technological and scientific levels in Turkey is contemporaneous. State-of-the-art devices (direct and indirect radiographical systems, phosphor storage plates, cone-beam tomography, etc.) are utilized not only in faculties but also in private clinics. 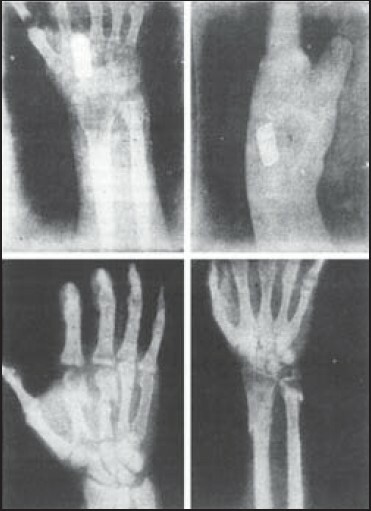 Exploration of X-rays is one of the greatest revolutions in medicine. Although the use of X-rays in medicine was adopted in Turkey after 1 or 2 years of their discovery, the acceptance of the value of X-rays in dentistry was considerably slower. However, after dedicated efforts by several dentists, radiology became established in dental institutions in Turkey. Today, Turkish dental radiology is concordant with international standards, and dental education is provided according to the guidelines established under the ERASMUS program. However, to the best of our knowledge, our article is the first one in its field and includes beneficial information, which draws the attention of young dental radiologists, dentists and historians in the history of their career (not only in Turkey but also in other countries). We dedicate this article to the memory of Dr. Esat Feyzi, Dr. Rifat Osman and dentist Galip Abdi Rona. Figure 1: (a and b) Glenner RA. 80 years of dental radiology. J Am Dent Assoc. 1975;90(3):549-63. Figures 3a, 4 and 5: Pırnar T, Dicle O. Yüz Yıllık Yolculuk. Başlangıcından Günümüze Türk Radyolojisi. İstanbul:5G Matbaacılık; 1995. 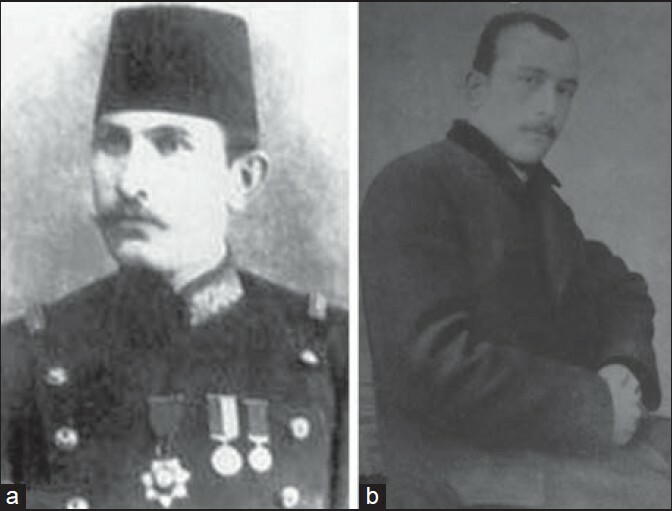 Figure 3: (b) Kazancıgil R. Dr. Rifat Osman'ın Öğrencilik ve Gülhane Anıları (1879-1921). Ankara: GATA Basımevi; 1998. Figure 6: Author's private archive. Figure 7: Diştabipleri Cemiyeti Mecmuası (Magazine of Association of Dentist) 1928. Figure 8: Diş Tababeti 1936 yılı albümü. Istanbul Üniversitesi Tıp Fakültesi yayını. İstanbul 1936. 1. Eisenberg RL. Radiology: An illustrated history. St. Louis: Mosby-Year Book Inc; 1996. p. 380-8. 2. Frommer HH. The history of dental radiology. Tex Dent J 2002;119:416-21. 3. Langland OE, Langlais RP. Early pioneers of oral and maxillofacial radiology. Oral Med Oral Surg Oral Pathol Oral Radiol Endod 1995;80:496-511. 4. Ring ME, Dentistry. An illustrated history. New York: Abradale Press; 1993. p. 272-3, 306-7. 5. Ulman YI , Livadas G, Yildirim N. The pioneering steps of radiology in Turkey (1896-1923). Eur J Radiol 2005;55:306-10. 6. Özden AM, Ünver AS. Ölümünün 45inci yýldönümünde ilk röntgencimiz Esat Feyzi. Ýstanbul: T.C. Ýstanbul Üniversitesi Týb Tarihi Enstitüsü; 1946. p. 2-9. (A book written about the first Turkish radiographer in the history, Esat Feyzi). 7. Anonymous. Türk Diþ Tabipleri Cemiyeti albümü. 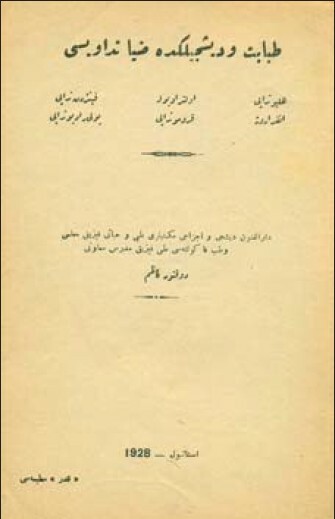 Ýstanbul: Hüsnütabiat Basýmevi; 1946. p. 50-3, p. 58-62. (An albume of the Turkish Association of Dentists. Has no writer). 8. Efeoðlu A. Diþ hekimliði tarihi. Ýstanbul: Yüce Reklam/Yayým/Daðýtým A.Þ,; 1992. p. 119-32. (A book on the history of Turkish Dentistry). 9. Gürkan SÝ. Diþhekimliði röntgen bilgisi. Ýstanbul: Diþhekimliði Alemi Mecmuasý yayýný; 1951. p. 4-6. (An education book of dental radiology). 10. Anonymous. Diþtabipleri Cemiyeti Mecmuasý. 1929;40:28-30. (No writer. Magazine of Association of Dentist) (A critisim letter delivered to the magazine). 11. Anonymous. Diþtabipleri Cemiyeti Mecmuasý. 1933;53:4-15. (No writer. Magazine of Association of Dentist) (Reports of the 1st National Dentistry Congress). 12. Rona GA. Diþtababetinde Radiografi Plaklarýnýn Ýzahý. 1. Milli Diþtababeti Kongresi Bildiri Kitabý. Ýstanbul; 1932. p. 25-52. (A paper published in the 1st National Dentistry Congress proceeding book about the definition of radiographic plates in dental radiology). 13. Erkan M. Türk Diþ hekimliði bibliyografyasý 1909-1972. Ýstanbul: Erol matbabacýlýk; 1973. p. 90-1. (Bibliography of Turkish Dentistry 1909-1972). 14. Anonymous. Diþtabipleri Cemiyeti Mecmuasý. 1934;57-58:62-7. (No writer. News bulletin. Magazine of Association of Dentist). 15. Anonymous. Diþtabipleri Cemiyeti Mecmuasý. 1937;76:28,29. (No writer. News bulletin. Magazine of Association of Dentist). 16. Anonymous. T. Odontoloji Bülteni. 1937;1:208. (No writer name. News bulletin. Turkish Odontology Bulletin). 17. Erden F, Türk hekimleri biyografisi. Ýstanbul: Cituri Biraderler Basýmevi; 1948. p. 89-90. (A book of biography of Turkish medical doctors). 18. Anonymous. Diþtabipleri Cemiyeti Mecmuasý. 1937;74:26. (No writer. News bulletin. Magazine of Association of Dentist). 19. Anonymous. Diþtabipleri Cemiyeti Mecmuasý. 1938;85:23. (No writer. News bulletin. Magazine of Association of Dentist). 20. Anonymous. Diþtabipleri Cemiyeti Mecmuasý. 1937;81:27. (No writer. News bulletin. Magazine of Association of Dentist). 21. Bayýrlý G. Röntgen Iþýnlarý ve Diþ Hekimliðinde Uygulamalar. Ýstanbul: Ýstanbul Üniversitesi Yayýnlarý; 1994. p. 1-2. (A education book on the x-rays and it's applications in dentistry). 22. Diþ Tababeti. 1936 Yýlý Albümü. Ýstanbul: Istanbul Üniversitesi Týp Fakültesi yayýný;1936 (Albume of the graduates of the education year 1936). 23. T.C. Istanbul Darülfünunu Talebe Rehberi, 1928-1929 Seneyi Dersiyesi. Ýstanbul: Ýstanbul Darülfünunu yayýný; 1928. p. 290-3. (Istanbul University Student Handbook of 1928-1929 training year). 24. T.C. Istanbul Darülfünunu Talebe Rehberi, 1929-1930 Seneyi Dersiyesi. Ýstanbul: Ýstanbul Darülfünunu yayýný; 1928. p. 290-3. (Istanbul University Student Handbook of 1929-1930 Training year). 25. Alper R. Meslek haberleri. Odonto-Stomatoloji Bülteni. 1962;8:13. (A news bulletin about dentistry in the Journal of Odonto-Stomatology). 26. Uzluk FN. Ankara'da diþ hekimliði yüksekokulu açýlýrken. Ankara Üniversitesi Týp Fakültesi Diþ Hekimliði Yüksek Okulu Bülteni 1966;1:5-10. (An article published in the bulletin of Ankara University Faculty of Medicine Academy of Dentistry about the establishment of Academy of Dentistry in Ankara).